Would you and your group like to entertain guests in our beautiful lobby prior to one of our 2012 Christmas Show performances? We’re extending an opportunity to church choirs, school choral groups, hand bell choirs, neighborhood singers, barbershop quartets, and all other singing groups to perform Christmas carols prior to a show in November and December. Groups of any age and size are welcome to participate. To take part, groups should have well rehearsed carols lasting a total performance time of 45 minutes. Space will be provided in the lobby, and your group will have the opportunity to carol a cappella as guests are arriving for the show. In addition, if you have a group of ten or more and would like to stay and enjoy The 2012 Christmas Show, we have a special pricing package available for your group as our thank you for caroling. For discounted tickets, your group of ten does not have to include only those performing. Please feel free to invite family and friends to enjoy this day with you as well. All members of your group will receive the discounted ticket price. 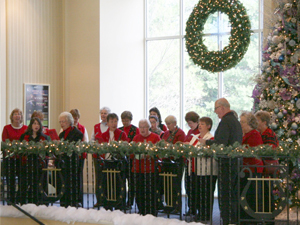 If you are interested in performing in our lobby prior to a 2012 Christmas Show, and to find out more about our special caroling pricing package, please contact Meghan Young, Group Sales Coordinator, at myoung@amtshows.com or 800-648-4102 x 6200.